What Kind of Dental Implant Is Right For You? - Gernot H. Winkler, D.D.S. Nobody wants to be eating dinner, enjoying a great meal, and have their teeth fall out. That’s one of the major problems with dentures. While other tooth replacement procedures are permanent, dentures must be removed on occasion. These days, with the help of modern technology, you can skip all the regular headaches of dentures (having them fall out, finding reliable adhesives, leaving them in a cup of water at night, etc.). Consider having new teeth surgically implanted into your mouth. You’ll get to treat them just like your own real teeth, keeping them in your mouth at all times. Below, we’ve compiled some of the major benefits of implants and the different styles of procedures out there. Read on to educate yourself about how tooth replacement works and if it is the best option for you. Because they’re built to last, dental implants are long-term solutions for those who might be losing teeth or who need teeth pulled. So, how do implants work? The root of the tooth is replaced with an artificial tooth and an anchoring material. Usually, this anchor is made of titanium (or another comparable metal). The implant is anchored into the jawbone where it then fuses with the natural bone. It acts just as your tooth would, staying stationary and providing a base for strong, artificial teeth. These are just some of the standard qualifications. It’s always best to speak with your dentist to learn more about the procedure and what it means for you specifically. There are three major types of tooth replacement implants. The “best one” varies and depends on your unique situation. Again, speak with your doctor to determine which type would be best for your individual case. These types of implants are the most common (or at least the most popular) option out there. 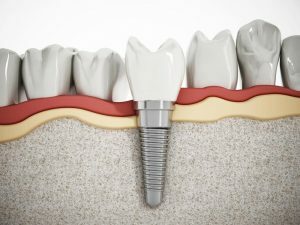 Endosseous implants are shaped like a screw or cylinder and are placed inside of the jawbone. The issue here is that patients must meet certain criteria of bone density and width for it to be successful. If you don’t have enough bone or don’t qualify for Endosseous, don’t fret! Subperiosteal implants are a quick runner-up. They work by using a metal frame that is fastened beneath the gums, but above the jawbone. This type of implant uses pins or a frame that is fastened through the jawbone and gum tissue. The Transosteal implant is the most invasive of the three, but it’s still a valuable alternative if the patient doesn’t have enough bone to support more traditional implants. Implants can save you a lot of stress and humiliation in the long run (especially compared with dentures). With implants, you’ll be able to speak normally, keep your teeth in your mouth, eat your favorite foods, and more. Make sure you talk with a qualified dentist about the best procedures out there for you. If you’re on the hunt for exceptional general, cosmetic, or restorative dentistry, give Gernot Winkler, D.D.S. a call today!